Thursday night in Des Moines was a late one. It was almost midnight by the time we got done with our work and it had been quite a while since we had eaten. I started doing Google searches to find a 24 hour restaurant. I didn’t find much. It was mostly McDonalds, Perkins, and IHOP. None of which sounded good. I did find one that sounded good to me. Co-Workers didn’t agree but I honestly didn’t care. I told them we could stop at McDonalds if they wanted for them but I was getting Mexican. 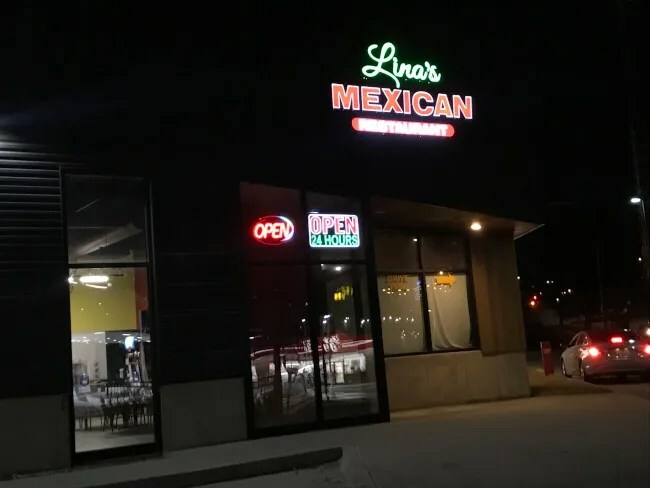 Lina’s Mexican Restaurant is in a small strip mall at the corner of Keosauqua and Crocker on the southwest side of downtown. Unfortunately, the dining room is closed at this time of night and only the drive thru is open 24-hours. This worked out fine since, at first, it was just me getting food. There was just one car in the drive thru in front of us when we pulled in but he was pretty quick. I pulled up to the speaker which has a back lit menu board a few feet from it. I put in my order for five carne asada tacos and carne asada fries. 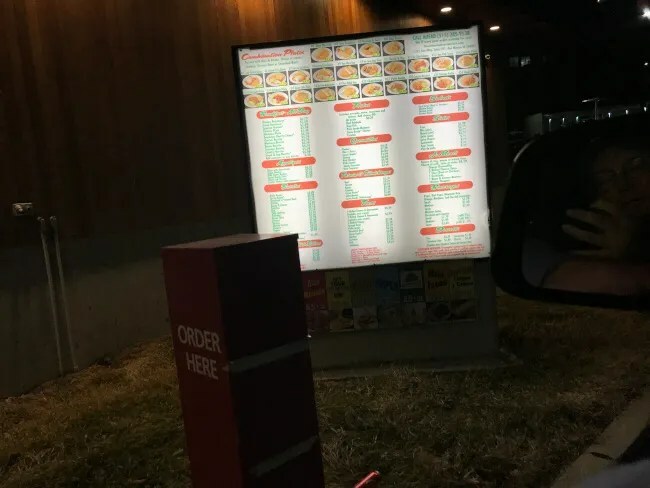 The guy working the drive thru speaker kept asking me if I wanted everything on my tacos but I didn’t know what that meant. Fortunately, after three tries, I figured out he was saying guacamole which I definitely didn’t want. My co-worker at the last minute decided Mexican was good enough and order the #18 combo which is two burritos with beans and rice. The total for our two meals was a little over $33. Our food came out pretty quickly so we headed back to our rental in Ankeny. 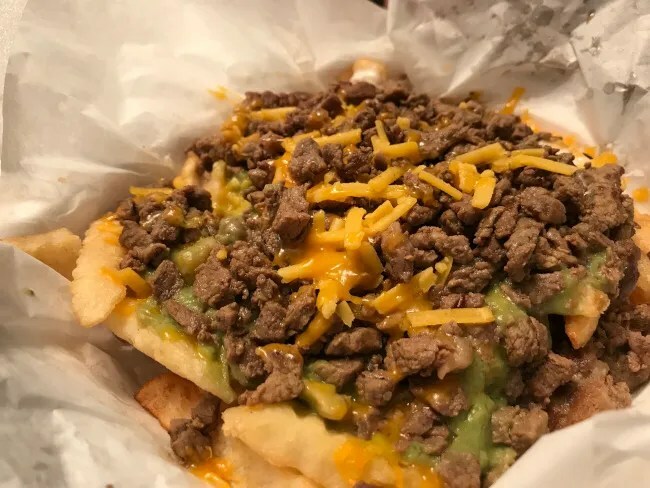 I popped open the carne asada fries first. They didn’t have any descriptions of what was on the fries on the menu board and there is no good online presence by the restaurant that I have been able to find so I was little surprised when I opened the box and foud both guacamole and sour cream underneath a thick, delicious layer of grilled steak and cheese. The fries themselves were a huge serving and frozen crinkle cut fries. The guacamole and sour cream was layered on next with each on half of the fries. I pushed off as much as the condiments as I could and still tried to enjoy what was left and for the most part I did. It’s more of a fork and knife kind of side but the steak is really tender and very flavorful. When I got about halfway through the fries, I switched to the tacos. The thing that surprised me was each taco only used one corn tortilla. There was a huge amount of steak, pico, and cilantro on each of them and the single tortilla was in a losing fight with all of the juices. I ate them as quickly as I could after I picked them up because I knew I didn’t have much time. 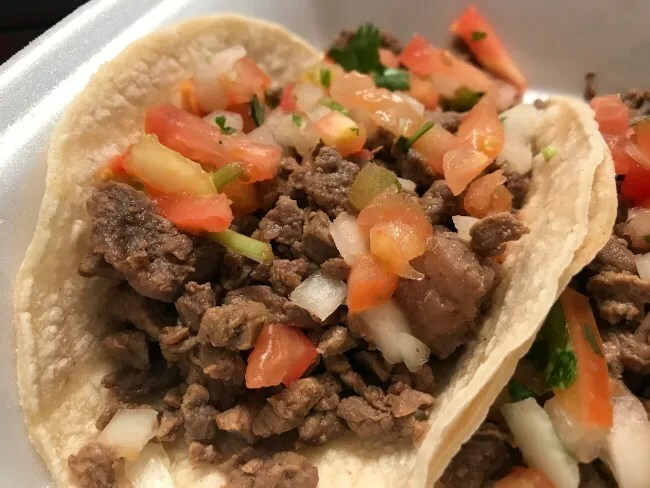 Each taco had such a delicious mixture of the salty, seasoned steak and the fresh juicy pico de gallo. Another tortilla would have made these tacos great because I wouldn’t have had to eat so fast but as far as flavor, these were right on point. 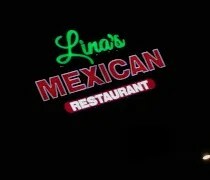 Lina’s Mexican Restaurant was once voted the best 24 hour restaurant in the whole state of Iowa. 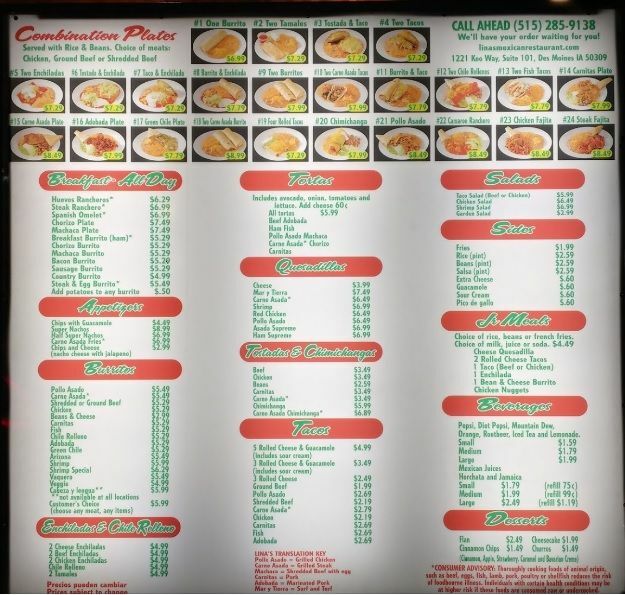 There were a few things that I would change about my order now that I know but overall, it was a pretty tasty meal and definitely better than a Perkins or McDonalds at that time of night.